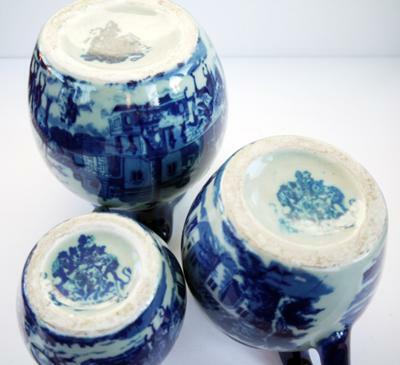 Set of 3 Blue and White Heavy Pottery Pitchers, illegible mark looks like 2 lions rampant or lion & unicorn:- I recently purchased this set of 3 very heavy and thick pottery pitchers at a local general sales auction. They were in a box of miscellaneous china and household items. Each has a backstamp but none of them are legible. It looks like the stamps have been smeared during application. The pots are of a very thick construction, I would say at least 1/4" thick. They are really substantial. The pattern, which extends around the whole piece, is a pastoral scene looks like two men on horseback approaching a villa. Again this transfer is not very clear. They are not so much blue and white as blue and clay coloured. I really like them and would love to know who the potter is, how old they may be and, of course, what their worth is. I have spent hours googling potters marks and found a couple which I thought could be the ones, Etruria or maybe Ironstone of some kind, but am not knowledgeable enough to make a definite decision. There are a few potters marks from the USA which could also be similar, but I would find this hard to believe as I bought these in the Welsh Valleys in the UK. It is difficult to tell from the photos and the very smudged markings, but is this device a lion and the unicorn rather than two lions? On another thread, we have recently identified the another smudgy old looking double lion mark as a very clever modern reproduction range from China (use the in house search engine top right to find it). This might be authentic looking items from the same maker - look on the bottom for signs of age. However, putting that doubt to one side these items to all intents and purposes might well be early Victorian Staffordshire flow blue - mid 18th Century. I'll throw a few names out who the maker might have been (or the area which the modern Chinese developers are paying homage to in their incredible impersonation). Now, as far as I know, Shelton is not a company but one of the historic pottery making townships of Staffordshire. I believe it is associated with a number of well known firms from the 18th and 19th centuries including the New Hall Works, Ridgways, Cauldon, and Wedgwood etc. In the 1840's and 1850's Shelton was also home of a W. Hackwood & Son who, I believe might well have made flow blue earthenware of this nature. They apparently, according to Goddens, mostly used a simple 'Hackwood' (i.e. their name) mark of various types, but I don't know if they also used the lion & unicorn device which Kovel's attribute to 'Shelton'. They were based at the New Hall Works, Shelton for about 14 years, the same venue as the firm who earlier had made the first UK hard-paste porcelain at New Hall until about 1812 (when it was superseded by Spode's bone china invention of 1799). 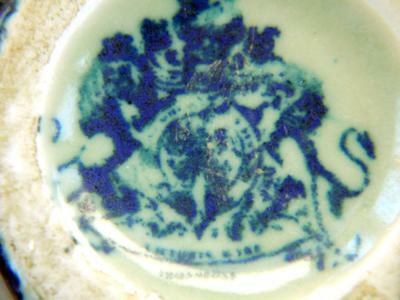 Other makers at the time also used very similar markings - using heavily imprinted lion and unicorn device, with similar round shield and top crown with a small lion detail. They would all likely have been making flow blue earthenware. All these 3 firms used virtually identical devices as shown on your items. Many other of the older firms both in the UK and USA used similar lion and unicorn devices, but none of them show the small lion on top of the raised central crown at the very top of the mark. Remember though (as I am learning from your submissions all over this website) that this grey area of only partly catalogued antique makers is just the area the modern Chinese reproduction factories are targeting. Hope this helps you research. i have three pitchers also same stamp on bottom. mine are a little different in size and shape. 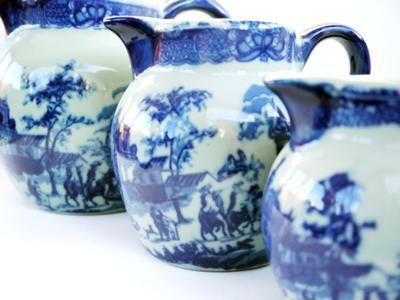 look up victoria ironstone pottery and you will find some identical to yours. hope this helps. Many thanks for the heads up. I found the reference at www.thepotteries.org. These Chinese makers are 21st century, and probably still making today, so, as I suspected in my original reply, working the area of doubt over the early flow blue Staffordshire makers. Keep an eye out and buyer beware! I have the same stamps on my tureens , they are worn out more and the scenes are horseman in a villages town square, there are alot of little cobweb like cracks all through my tureens inside and out, outside dark color cackling, while inside white crackling,I wish I knew the year of these . I have handles and lids for both. I forgot to mention , I also have what looks like a sword on the left side of my mark of the 2 lions or lion and unicorn or a j with a line through it,,, the tails have the same arrow head on them. looks like a line drawn from one lion to the other with very fine print on that line, I think 3 numbers also on the line.???? I have an oblong small tureen exactly like everyone is describing. I bought it in a hurry thinking it was real but upon examining it at home I feel certain that Peter is right. It's a fake! Eeek! Good lesson learned. I have a matching pitcher with a handle. It has the same marking and pattern. Wording "??? ware London ?? ?5" Does this help to identify? Mine is 2 lions not a unicorn. 2 Lions is Modern Chinese? I have a small milk or cream jug with a floral design,the mark is a lot clearer and is a lion and unicorn with a line linking both under the line I can make out the words "stoke on Trent" and on top of the line the word is harder to read I can make out what looks like "till^^^er" there is a space and then another word or date. I HAVE A BEAUTIFUL OLD LOOKING FOOTBATH. I THOUGHT THAT IT MIGHT BE AN ANTIQUE. HOWEVER, NOW THAT I HAVE INVESTIGATED IT FURTHER, I THINK THAT IT IS A FAKE MARK.MINE HAS THE MARK WITH THE LIONS AND THE WORDS ARE HARD TO MAKE OUT. I LOOKED UP CHINESE MARKS AND FOUND THAT MARK. THE WORDS ON THE MARK ARE VICTORIA WARE IRONSTONE. IT SAID THAT IF THE MARK IS LARGER THAN A QUARTER(COIN)IT IS PROBABLY FAKE. ALSO, IT SAID THAT MOST PORCELAINS WERE COMPLETELY COVERED WITH GLAZE. THE FAKES WILL NOT BE GLAZED ON THEIR RIMS AND USUALLY THE RIMS ARE THICKER THAN THE ON AUTHENTIC PIECES. ALSO, AUTHENTIC PIECES SHOULD HAVE A COMPANY NAME, A PATTERN NAME AND COUNTRY OF ORIGIN. BE WARE IF THOSE THREE THINGS ARE NOT PRESENT. REMEMBER, THERE ARE MANY DIFFERENT SIGNS OF A FAKE TO LOOK FOR. HOPE THIS HELPS! I picked up a gravy/sauce boat with the same markings. Very sturdy with a little stand underneath. It has a lion and a Unicorn and a little lion on the top. I cannot make out the markings. Has anyone seen one of these please? Victoria ware and below this ironware. Another fake - but it's still attractive. The illegible double-rampant lion mark is discussed in article below; pictured in Fig. 39. Just to about to bid on a pitcher w/this mark at auction and stumbled across this and linked page. Appears to be contemporary China fake. Interesting, indeed! I have a Flow Blue teaPot from an Estate, she collected Only Flow blue. I have the same mark however using higher powered loop I pick up the word IRONSTONE at the bottom of the mark in a semi circular position. Hope this helps and I shall continue to research the piece.